David Asman: Well Iran is thumbing its nose once again to the international community: The country testing the newest version of a medium range ballistic missile today. It’s a weapon with a range that could strike in Israel or U.S military bases in the Gulf. All of this comes as President Bush presses Iran to give up its nuclear ambitions. 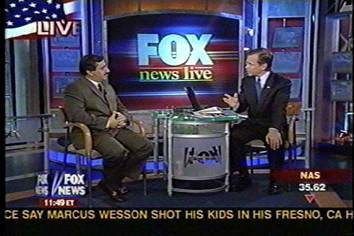 For more on all this we are joined by Fox News foreign affairs analyst, Alireza Jafarzadeh. Alireza, Good to see you. David Asman: First of all, the freshest news that we have is that these three Iranians who we thought were captured were actually arrested in Iraq. What is an Iranian journalist anyway? Alireza Jafarzadeh: Well, If you are talking about independent Iranian journalists, we don’t even have them in Iran, they keep shutting down the papers. These are actually agents of the Ministry of Intelligence and the Revolutionary Guards. David Asman: Do you know that for a fact? Alireza Jafarzadeh: I don’t know about this particular case, but in the past there were a number of supposedly “journalists” who were arrested for taking films and they were interrogated and kept by the US military and after a few months they were released and returned back to Iran and guess where they ended up? They became members of the Iranian regime’s parliament. David Asman: Again we want to emphasize we have no information on the background of those who were picked up and arrested; we don’t even know what they were arrested for, so that may not turn out. Another fiasco involving someone who has been walking between Iran and Iraq is Ahmad Chalabi, the man the US was relying on for a lot of its information before the Iraq war. He was arrested in Iran and now apparently he has come back into Iraq. What are the Iranians doing with Chalabi, or what is he doing with them? Alireza Jafarzadeh: Well, certainly, as far as Iran is concerned, they have every interest possible to use anybody including Mr. Chalabi for spreading misinformation and lies and also trying to extract information and intelligence about Iraq. They are masters in doing that. Mr. Chalabi’s relationship with Iran is no secret, but what is becoming evident is that Iran is trying to feed misinformation both against its own internal enemies, the Iranian opposition or trying to enhance its own status. So I think this once again puts the focus on Iran and what nefarious plans they have for Iraq. David Asman: and Alireza, finally nukes and missiles. Apparently the Iranians are violating certain agreements by testing out these missiles, correct? Alireza Jafarzadeh: well, I don’t know if they are violating agreements but certainly what they are trying to enhance the Shahab-3 both in terms of range and accuracy, and this could also be helpful for their longer range missile that they are already working on, Shahab-4. David Asman: And they can put nukes on tops of all these missiles. 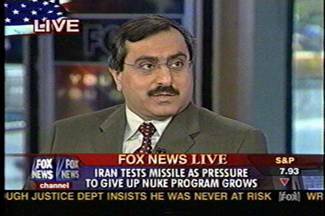 Alireza Jafarzadeh: They can definitely put nukes on top of all these missiles. David Asman: Alireza Jafarzadeh, always a pleasure. It’s a big subject; we’ll have to have you back. Alireza Jafarzadeh: Thank you very much David.